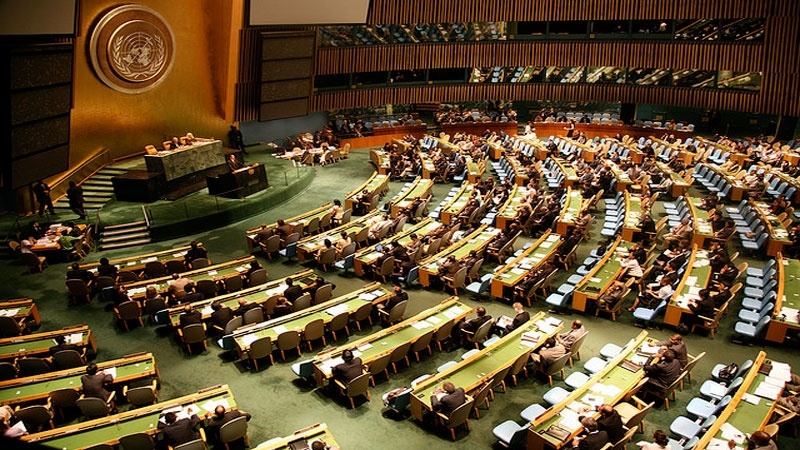 According to Syria’s official news agency SANA, the resolution, which was based on the recommendations of the Second Committee — Economic and Financial Committee – was adopted by a record vote of 159 in favor, 7 against and 13 abstentions in a Sunday session of the 193-member Assembly. The Assembly on Sunday also called on UN Secretary-General Antonio Guterres to submit a report during the next session on the implementation of the resolution, including issues related to the increasing impact of exploiting, damaging and depleting natural resources in the region by Zionist regime’s forces. Furthermore, the Syrian delegation to the UN called on Guterres to denounce and stop some “dangerous” practices of Zionist regime in the occupied Golan Heights that “violate” the international law. In late 1981, Zionist regime passed the Golan Heights Law that extended the regime’s “laws, jurisdiction and administration” to the Golan Heights, effectively annexing the territory to the Occupied Palestine.